Dynamic Balancing machines features a very simple operation. The working cycle is fully automatic. From safety point of view a double press push button starts machine, measures and stores, the unbalance values on DPMs for two planes simultaneously and stop machine ( with brake if machine is provided with electrical breaking facility.) The measuring cycle general is less than 10 seconds for normal rotors which can be accelerated within 5 seconds. To have smooth and gradual acceleration models HDM - 3,000/- 7,000/- 10,000/- 20,000/- are provided with slipring motors in order not to have damage to drive couplings as well other rotating parts in drive systems like gears etc. The starting of these machines is done manually by cutting resistances of starter in 4 to 5 steps. key-board facility provided on measuring panel for correct data feeding of rotor with 1 digit accuracy for itsdimensions like A, B, C, R1 & R2. Tolerance limits of both correction plans i.e. tl1 and tl2 can be fed, so that when rotor is balanced within the limits respective LEDs glow up, indicating no further correction necessary. For other details please refer 'Features of Measuring panel HDM-8500'. 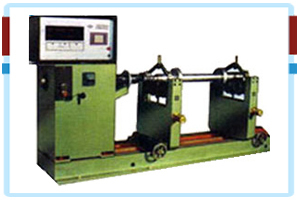 The usable length of machine is established according to the longest roter to be balanced. Extension beds can be supplied on request, which can be dded to standard bed of machine. It is also possible to install an additional bed ( Gap bed ) with a pit between this bed and standard bed of machine in order to balance rotors having its outside diameter exceeding swing over standard bed. Models HD-7,000- 10,000/ 20,000 are provided with fixed separate drives and hence gap-bed design is not possible. Amount and angle of unbalance for both planes displayed on separate DPMs. Hence linear accuracy is very goos as compared to analog meter + /- 1 digit for amount and +/-1 degree for angle. No necessity to stop machine once started. It stops automatically after stabilization of unbalance results. Amount and angle of unbalance in both planes displayed simultaneously and remains displayed (stored ) till next run. This totally eliminates operation of plane selector and reduces additional time for stabilization of readings in other plane. Data of rotor dimensions and balancing tolerance i.e. values of A,B,C,R1,R2, t11,t12 are fed by key operation . Hence accuracy of data feeding is accurate up to 1 digit. Minimum achievable unbalance per Rotor Weight (for max. weight or rotor) gmm/kg 0.5 0.5 0.5 0.5 0.5 0.5 0.5 0.5 0.5 0.5 0.